MPC’s Stainless Steel Back Panels are a great choice to reinforce and support metal and plastic overlays because of their structural strength and ability to resist corrosion. Stainless steel is used often for its superior performance in highly caustic and acidic environments, as well as for its antibacterial properties and resistance to scratches, dents and stains. 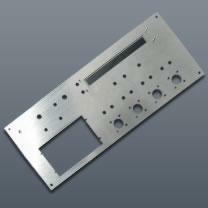 Why Choose MPC’s Stainless Steel Back Panels? Superior performance in highly caustic and acidic environments that would attack aluminum. Excellent resistance to chemicals, abrasion, solvents, corrosion and oxidation. Will withstand exterior exposure in the harshest environments, including extreme cold and heat. Low maintenance expenditures in the form of repair and replacement costs. Expected exterior life of up to 20 years. Commonly produced using unfinished mill stock which may contain surface scratches or other minor cosmetic imperfections, which are usually hidden by the overlay. Optional treatments are available to improve corrosion and abrasion resistance, such as the application of a formulated paint. Precision fabrication in our machine and print shops to your design specifications using stainless steel face stock (thicknesses from .060” to .120”). Stainless Steel Alloy 304 in standard thicknesses of .060”, .090”, and .120”. Note: Additional alloys and thicknesses available on request. Mill finish is standard. Optional finishes include: #4 Brushed, and paint or powder coating. Advanced precision fabrication capabilities including countersunk and counterbored holes, bending/forming, stud and stand-off insertion, permanent pressure-sensitive adhesives, and more.